What does GW mean? 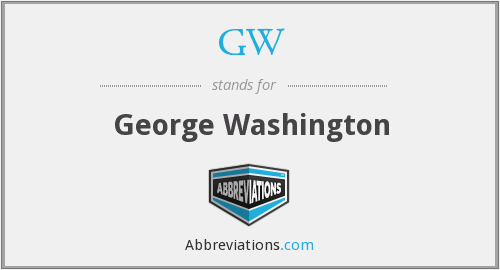 This page is about the various possible meanings of the acronym, abbreviation, shorthand or slang term: GW. .gw is the Internet country code top-level domain for Guinea-Bissau. The Fundacão IT & Media Universidade De Bissau is the central registry for all domains for .gw. Pre-registrations are being taken at register.gw. Launch date and Sunrise registration period to be announced at the 34th ICANN meeting in Mexico City. Couldn't find the full form or full meaning of GW? Know what is GW? Got another good explanation for GW? Don't keep it to yourself! "GW." Abbreviations.com. STANDS4 LLC, 2019. Web. 20 Apr. 2019. <https://www.abbreviations.com/GW>.